Painted in Giverny in 1891, In the Orchard incorporates the solid figures, dappled light, pure colors, and broken brushwork in the leaves and blossoms that characterize Theodore Robinson’s mature Impressionist work. 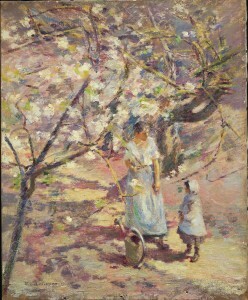 In the Orchard was lent to the Armory Show by the New York dealer William Macbeth and offered for sale at $500. According to his gallery records, Macbeth had the painting on consignment from Hugo Reisinger since November 1911, but could not sell it. In February 1915, following Reisinger’s death, the executor of his estate requested that it be returned to his widow. It was included in the January 1916 sale of Reisinger’s collection at American Art Galleries in New York, where it was purchased by D. Charles. In January 1941, it appeared in another sale of Reisinger property held by Kende Galleries at Gimbels in New York, where it was purchased by Frank Jewett Mather, Jr.—the critic who had dismissed it in 1913 as a “minor” piece. He gave the painting to the PrincetonUniversityArt Museum in 1943. See William H. Gerdts, Lasting Impressions: American Painters in France, 1865-1915 (Evanston, Illinois: Terra Foundation for the Arts, 1992), 133-134. Frank Jewett Mather, Jr., “The Armory Exhibition—II,” The Nation 96:2489 (March 13, 1913): 267. “International Art,” New Evening Post, February 22, 1913, 5. Macbeth Gallery Records, Archives of American Art, Smithsonian Institution, microfilm reel 2625, frames 970-971, 973, 975, 977. Macbeth Gallery Records, Archives of American Art, Smithsonian Institution, microfilm reel 2625, frame 997. The Valuable Pictures by Foreign and American Masters, American Art Association, New York, January 18-20, 1916, lot 9. Brussels XVII Century Tapestry, Bronze Group by Rodin, Etchings, Oil Paintings …, Kende Galleries at Gimbel Brothers, New York, January 16-17, 1941, lot 117.